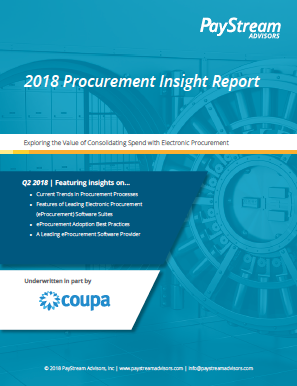 Exploring the Value of Consolidating Spend with Electronic Procurement. Many procurement departments are still using traditional manual processes or outdated technology. The result? Rogue spending, missed discounts from supplier contract pricing, reconciliation headaches, and the list goes on. These business risks are driving more organizations towards the cloud-based, secure, and workflow-friendly world of eProcurement solutions. These solutions are saving money and resources, improving use of budgets and personnel, enabling centralization, and using data to improve and streamline end-to-end purchasing processes. Complete this form to receive your free copy today. "We would buy it again. Real increases in productivity."